Announcement Remember Mom in May! Remember Postage takes a bit, don't put it off! Remember to remember! Same Etsy store, easier to find. Remember Mom in May! Remember Postage takes a bit, don't put it off! Remember to remember! 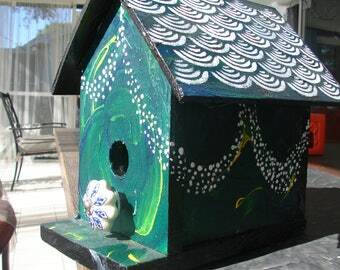 Give Mom the gift of two hummingbirds and an owl this year with our Art Nouveau bird house, handmade and painted. Japanese Iron Mini Teapot. Late Edo/Meiji periods. Signed. Free Ship! Lincoln's Cottage features a penny roof in a fishtail pattern. Custom Birdhouse - Kinda. Limited choices mean you get a personalized birdhouse at a fraction of the price is just a week or two. FSU license plate outdoor birdhouse, perfect for your super fan, great conversation starter, Go Noles! Historic house, outdoor birdhouse, widows walk, vines, handmade & painted one of a kind. Free ship! So amazing! Wonderful to work with and truly made with love! We love love love our bird house. They captured all the important aspects of our home and family life! It was a pleasure to work with them! How about a faux copper faux patina? Our most requested house, we always try to have one or two in stock and ready to ship! One of my favorite houses so far. Tiki Gods! Our custom houses are a complete labor of love. Faith is the Daughter. Wheelchair but still rocking silver polish and paint brushes. Can usually be found covered in acrylics and cathair. Bob is the Dad. Owns many tools. He makes birdhouses and still has a hard time saying "titmouse" in mixed company. Interested in a custom house that looks like your place? Buy nothing, send a pic to me in conversations and I'll get you an accurate quote. Interested in a custom painted anything? If you are unsure how to proceed, go head and contact me via conversations. We can talk through it and make sure things are going the way you envisioned. The card is a kraft paper tag tied with twine or ribbon. The gift message of your choosing is typed out in a pretty font and attached to the tag. Please include the message when checking out. The gift wrap is kraft paper too, but it usually is concealing a layer of bubblewrap. The paper is a nice way to cushion your gift while being pretty. Ribbon ties it all up and conceals the amazing amount of tape that sometimes gets used. If you buy a custom house, gift wrapping is free. Everyone else pays a whopping $1 for it.